The term ‘Wolf Hall’ has become widely recognised in recent years thanks to the title of Hilary Mantel’s Booker Prize-winning tour de force, released to much acclaim in 2010. Whilst the protagonist of Mantel’s fictional work is a certain Thomas Cromwell, Wolf Hall itself refers to the family home of the Seymours, a provincially important dynasty based in the Wiltshire manor house. David Loades book unquestionably intends to capitalise on the considerable attention given to Wolf Hall and its one-time inhabitants through Mantel’s award-winning words, but this isn’t to diminish the scope of Loades’ work; this is a long overdue assessment of the life and times of the foremost of the Seymours, briefly encompassing their beginnings to the apex of their influence during the reigns of Henry VIII and the Seymour-blooded Edward VI. 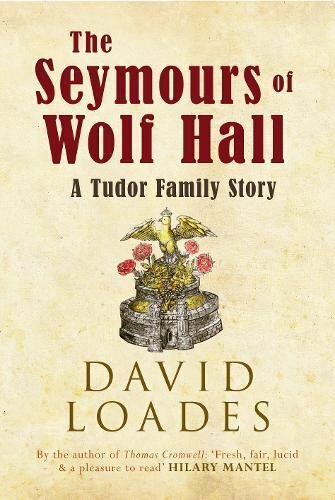 As Loades notes at the outset; “The Seymour family was one of the most prominent at the Tudor court”. Their worth as subjects of such a work does not stem solely from Mantel’s influence. The book is subtitled ‘A Tudor Family Story’, and with good reason, as the focus of the book is unquestionably Edward and Thomas Seymour, the brothers of Queen Jane who rose high in the Tudor court after their sister’s marriage to Henry VIII in 1537. Edward gradually replaced Thomas Cromwell as King Henry’s chief servant after 1540, becoming earl of Hertford, duke of Somerset and, after the accession of his nephew Edward VI, Lord Protector of England. Thomas was Lord High Admiral, and based at Sudeley Castle with his wife Katherine Parr, the final wife of King Henry, was briefly in custody of the young Princess Elizabeth. Queen Jane, meanwhile, was the focus of Loades’ previous work ‘Jane Seymour: Henry VIII’s Favourite Wife’, which serves as a great companion piece to this particular work. The author is an Emeritus Professor of the University of Wales, not to mention a fellow of the Royal Historical Society, and as to be expected from such an accomplished academic figure, the book is a thorough, thought-provoking, masterpiece when it comes to the Seymour family in the sixteenth century. You won’t find irrational leaps of opinion or wild speculation in this book unlike many other similar productions, but rather hard fact and logical conclusions drawn directly from available primary source material. Loades’ book is about the real Seymours and how they lived, politicked and endured, not fictional conjecture with little basis in reality. I do feel the book glosses over the origins of the family, founded in the seventh century, and quickly advances to the life and times of Sir John Seymour, the queen’s father, but this is probably not an issue for an intended audience primarily concerned with learning about the Tudor Seymours. This criticism is quickly offset by the engaging introduction from Professor Loades where he effectively justifies the necessity of his work. ‘The Seymours of Wolf Hall’ is ultimately a much-recommended companion to the more mainstream works on Henry VIII and his extraordinary reign, whilst also serving as a splendid book in its own right. It serves as an ideal read for those looking to broaden their horizons on all things Tudor, and ultimately, whether on topic or off, Professor Loades is one of the most eminent authorities on the Tudor court. There is much to learn from this book. David Loades was Emeritus Professor of the University of Wales and an Honorary Member of the University of Oxford, History Faculty. He was also a Fellow of the Royal Historical Society, Fellow of the Society of Antiquaries, Vice-President of the Navy Record Society and former President of the Ecclesiastical History Society. He is the author of over thirty books on the sixteenth century, specializing in the Tudors. Hahaha!!!! Hilary Mantel gets far too much credit for representing history in her potboilers. It’s cute. But not historically accurate.